The Music Library Management blog has been silent over the past two weeks as I've been away on holiday in South Africa. I had a great time, saw elephants, buffalo, cheetahs and lions, toured the Garden Route, sampled wines in Franschhoek and Constantia and enjoyed plenty of South African hospitality. Now I'm back, and work on bliss restarts. I plan on making available a new release this week with support for limiting the data size of album art (for example, no larger than 256K), a useful feature for all but especially for Sonos users who suffer from an issue with the Sonos controller. In the meanwhile, I am working on new features to upload your own art and improve the quantity and quality of album art matches from Discogs. I also discovered a new digital music blog in the past month which contains some great tips. It's called Tunecrux and is written by Fabrice Laporte. It's quite Mac and iTunes oriented but there's also some good general advice in there too. I've added the blog to the blogroll. 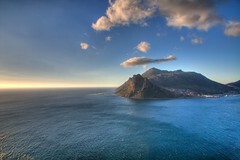 Thanks to Crouch 24/7 for the image of Hout Bay, south of Cape Town, above.